Merry Christmas! Thank you for this great site. That gift card is so cute!! I like TT on FB!!! I second that, pick me please! I already like your site on Facebook! This would be a fabulous Christmas gift! This is such a cute gift card! I’d love to win. And I love totally target! 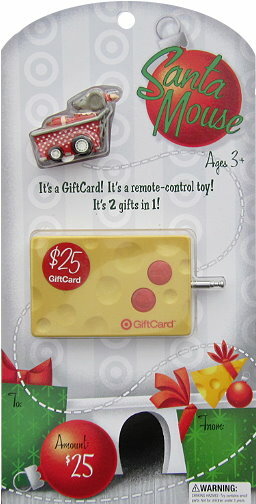 I love how its a remote control car and a gift card at the same time! I would LOVE to win this!!! What a cute gift card! Enter me please! I like TT on FB!!!!! The only thing I love more than Target is totallytarget.com!!! Love your site. LOVE your sight….and LOVE target. I go there at least twice a week! love your sight…Thanks for all the hot tips. Like totally target on facebook. Thank you for everything you do! Have a Merry Christmas! WOW!!! I would love to win this WOW card! Love totally target here and on facebook! thank you for te chance to win!